England's Commonwealth champion Claudia Fragapane finished 10th in her first World Championships all-around final in Nanning, China. Fragapane, 16, who won a record-equalling four gold medals at Glasgow 2014, was part of the sixth-placed GB squad from Wednesday's team final. She scored 55.615 in an event won by USA's defending champion Simone Biles. 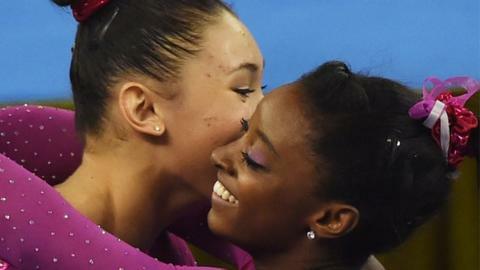 Biles' team-mate Kyla Ross claimed bronze, with Romanian Larisa Iordache second. GB's Ruby Harrold was 11th. Fragapane only made her British senior team debut at the European Championships in May and was pleased with her performance against the world's best gymnasts. "The experience of being in a World Championship final is just incredible," she told BBC Sport. "I'm really happy that I went out there and competed well under pressure." She will return for the individual beam and floor finals over the weekend, while team-mate Harrold - who was 17th in the 2013 World all-around final - will compete in the uneven bars. "I enjoyed that from start to end and the atmosphere was so good," the Commonwealth team gold medallist told BBC Sport. "To have that experience and to be able to produce a good routine shows that all the hard work in training is absolutely worth it." Biles, 17, is widely regarded as the USA's best prospect of an Olympic gymnastics gold at the 2016 Rio Games and by winning in China became the first American athlete to defend a World all-around crown since Shannon Miller in 1994. "I can't quite believe I've made history," she said. "I'm really proud to have produced those scores and routines tonight and hopefully I can keep pushing on from here." In addition to Fragapane's beam final, fellow Commonwealth champions Dan Keatings (pommel horse) and Becky Downie (uneven bars) will also return to action on Saturday when they will hope to challenge for medals.